All racing is running approximately 40 minutes late at the Sail Sydney regatta on Sydney Harbour, as officials at Woollahra Sailing Club waited for the sea breeze to fill in and it was worth the wait at around 12.00pm, those classes racing were thoroughly enjoying the 12-15 knot nor-easter. “Our schedule is back on track though,” said Principal Race Officer, Tony Denham. 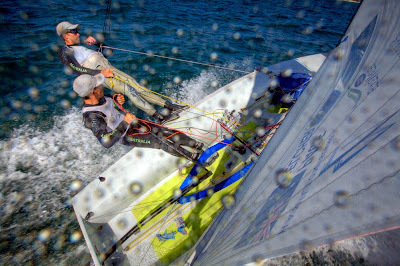 “The conditions are great, but the classes racing this afternoon have been warned about the strong outgoing tide. We want to try and avoid the OCS’s and Black Flags of yesterday,” he said. 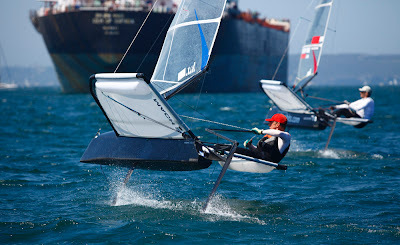 The Olympic class Laser, Finn, 49er, the Youth 29er and the radical Moth classes were first off the beach this morning and most are currently into their second races as at 12.25pm local time, while the Laser Radial, Laser 4.7, 470, 420 competitors have started their first race. After the shifty unstable light airs of yesterday, today’s conditions, including warm sunshine, are a welcome relief to all. 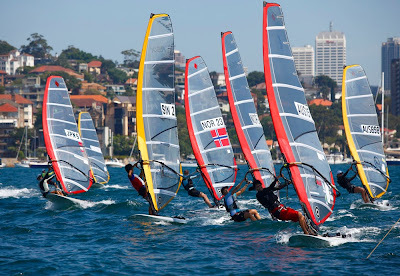 Forecast 5-6 knot shifty north and north-westerly winds, with no breeze at all at times, on a day when temperatures are set to soar to 30 degrees, is sure to test the 233 entries (292 sailors) and officials at the Sail Sydney regatta on Sydney Harbour. Hosted by Woollahra Sailing Club, with assistance from the Royal Sydney Yacht Squadron and Royal Prince Edward Yacht Club, the predominantly Olympic and Youth classes regatta is into its third day and for competitors it is basically make-or-break time, as tomorrow is the final day of the four day event. 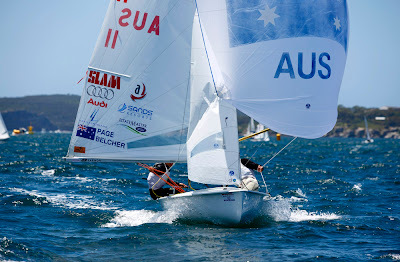 Not surprisingly, there are only two classes where the leaders have taken off on the rest of the fleet at this ISAF Grade 1 Olympic point-scoring event; Hannah Nattrass and Graham Biehl (AUS) have amassed a whopping 14 point lead over their nearest rivals in the Youth 29er skiff class, having won five of the six races sailed so far (with a third in the remaining race). Mat Belcher and his Beijing Olympic gold medallist crew, Malcolm Page (AUS), whose three wins yesterday lift them to five points clear of their closest competition and training partners, Sam Kivell and Will Ryan (AUS). Every other pointscore is exceptionally close, making today’s performances even more important. Principal Race Officer, Tony Denham, said that the race schedule is back on track, due to the beautiful 12-15 north-east sea breeze that met competitors yesterday. 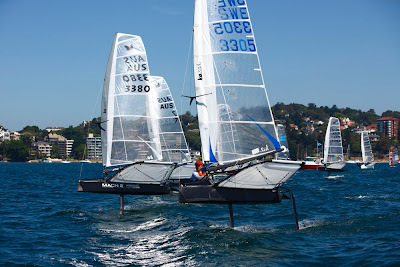 Those same competitors will have to switch gears and ready themselves for a ‘thinking’ day on Sydney Harbour, where tactics will be all-important. At 8.30am this morning, sailors were looking at a lovely nor-easter on the Harbour – will it still be there when they hit the water?